The full press release can be read here. 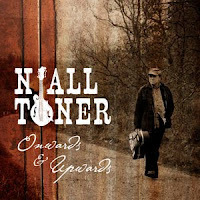 Niall Toner also has an artist profile on the Pinecastle website. 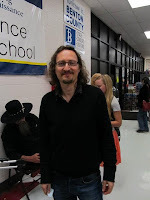 I am interested in getting our programme to listeners around the world where an interest and love for bluegrass and its roots are appreciated. I am wondering if you might have any suggestions of stations in your country or region that might be interested in such a programme. Any contact information would be appreciated. The show is offered free of charge, and is available from a secure download site in the NPR format. It is offered in two parts, both 59 minutes each, with a separate promo. You can find more information on Red Barn Radio from the website. Contact Ed Commons by e-mail. We would like to draw your attention to the possibility of placing advertisements in this very carefully edited and layouted magazine. 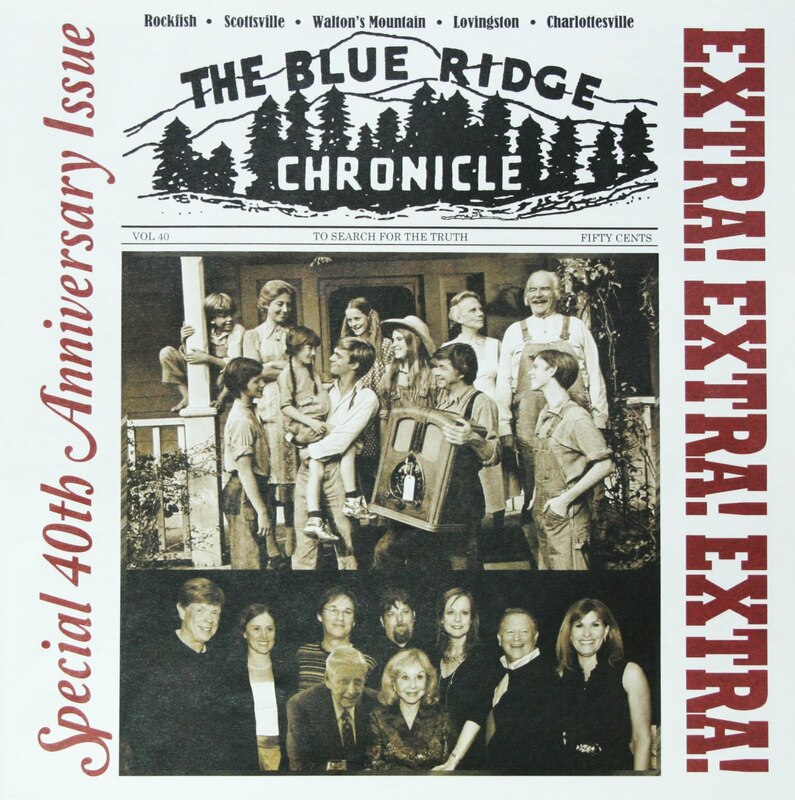 More ads are needed to finance the production and mailing of the printed magazine. Currently, EBMA's expenses on BLUEGRASS EUROPE are higher than what subscriptions and advertisements are generating. Advertising could be especially interesting to companies outside of Europe, touring artists, record labels with new CDs... Please contact be.advertising@ebma.org or check out www.bluegrass-europe.org for more information. The 17th Bluegrass Workshop of Jindra Hylmar and Petr Brandejs took place on 12-14 August 2012 in Malé Svatoňovice. 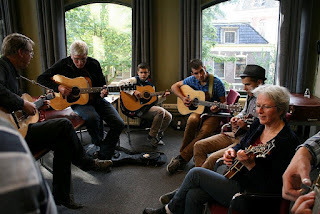 Everything went smoothly: 120 students, eleven teachers [above], Saturday night sold-out concert of Bluegrass Cwrkot and teachers (the two-and-a-half-hour-long video can be seen here), learning, jamming, having fun... 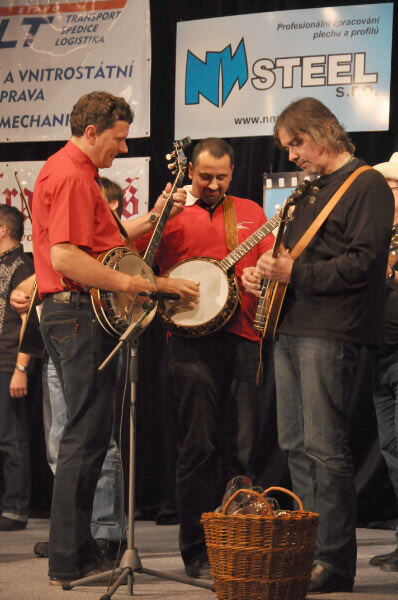 Present were world-class banjo maker Jaroslav Průcha and Honza Fišer who makes guitars. 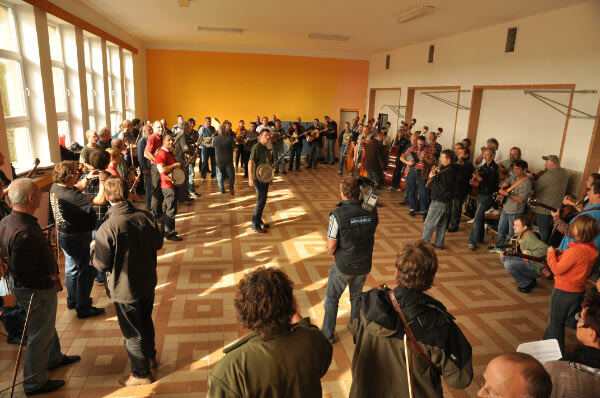 The usual Sunday afternoon farewell 'brutal jam' of all involved, playing three songs together, also took place [above]. For a very nice photo gallery, visit here. 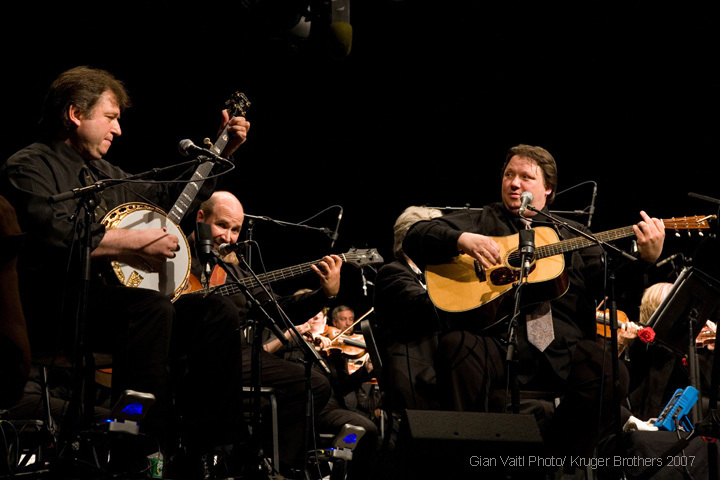 The picture on the right shows three banjo players at the Saturday night concert: (l-r) Petr Brandejs, Pavel Zícha, Luboš Malina. 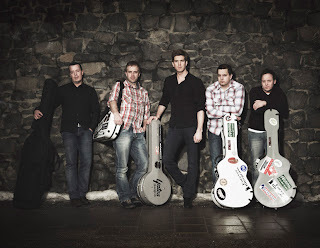 I’m happy to introduce the Mideando String Quintet from Italy. 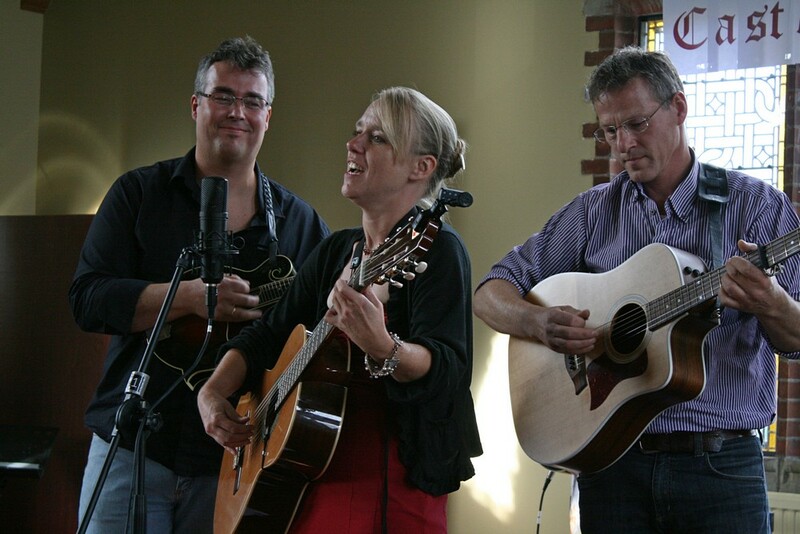 Our acoustic music is performed by mandolin, octave mandolin, mandocello, violin, acoustic guitar, and electric bass. 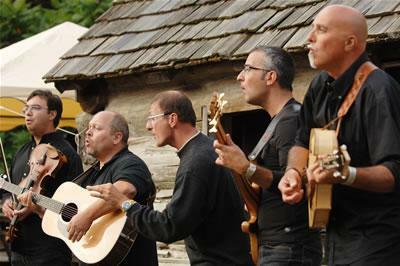 Our songs are usually arranged with five voices harmony. 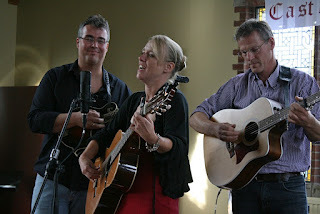 Our repertoire includes both our original songs as well as covers rearranged by the band to our personal style. 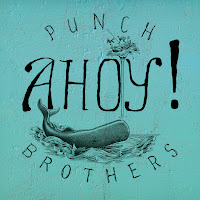 We like to describe it as 'auteur Pop' with a bit of jazz and ethno music and with some bluegrass influences. In May 2006 we won the first prize as 1# European Bluegrass Band at the 9th European World of Bluegrass (EWOB) Festival in Voorthuizen, the Netherlands. 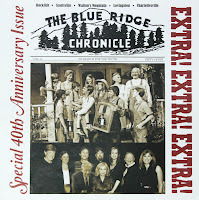 In this role, we were invited to represent European bluegrass at the IBMA 2007 World of Bluegrass in Nashville, Tennessee, USA. 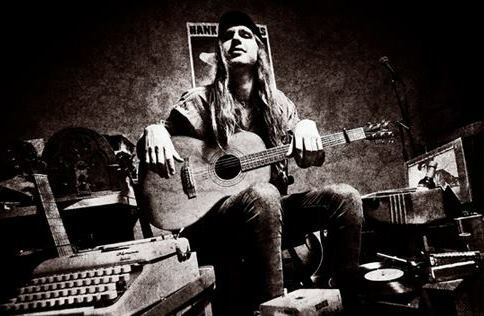 The song 'Talk about suffering', arranged by MSQ, was chosen for the official CD titled 10 years of EWOB. In the past years MSQ has won many other festival awards. Their previous CD, Viaggio... ('Journey') was thought 'one of the best Italian CDs of 2005' by the La Difesa Del Popolo journal. Their latest CD, Tutte le Direzioni has had some very fine and good reviews by the following magazines: Chitarre, L’Isola Che Non C’Era, Jam, Strictly Country, FolkWord, SNMA News, Movimenti.prog, WolrdMusicSounds, La Brigata Lolli – Bielle.org: all the comments spoke of 'an excellent CD... very good music'. As well, the important Kataweb magazine nominated MSQ 'Artist of the Day' in December 2008. During the past years Mideando played at various important music festivals such as the 40th Montreux Jazz Festival (Switzerland), Appalachian & Bluegrass Music Festival (Northern Ireland), EWOB Festival (Holland), EWOB Festival (Germany and France), Over Easy Bluegrass Festival (Switzerland), and Big Bear (Netherlands). 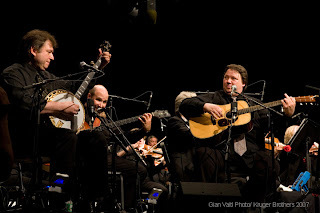 In August 2008 the band were special guests at the Festival Europeen de Bluegrass Music in La Roche-sur-Foron, France, where they played in 2009 too. At the moment the band is working on a new CD to celebrate their 18 years of musical activity. It will be ready in spring 2013. 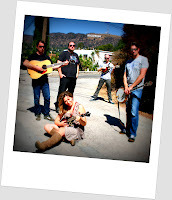 If you are interested in our band, you can look us up at our website. You can contact us by e-mail. Champion fiddler Ivor Ottley, originally from England, long resident in the west of Ireland and subsequently in Sweden, is shown (left) in Holladay, TN, where he won the West Tennessee Fiddle Championship earlier this year. 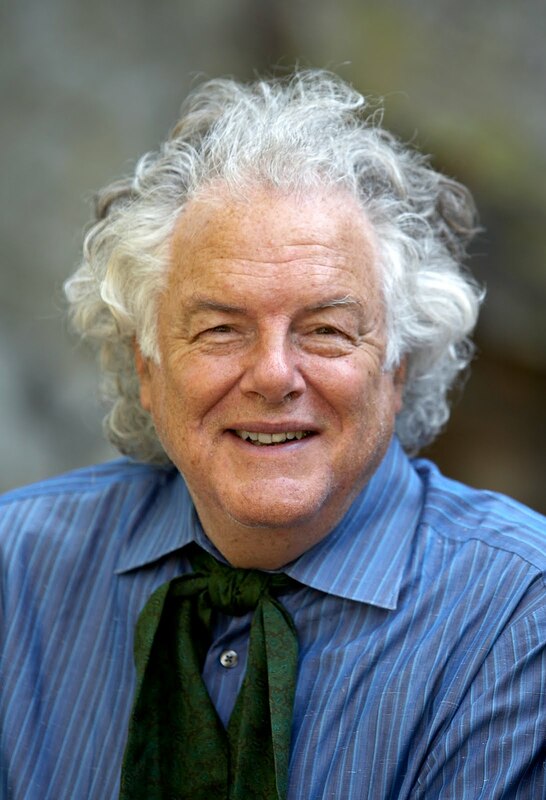 Ivor will be in Ireland between 12 December and 19 December, performing in the Galway area. He will also be available for teaching and workshops between those dates. 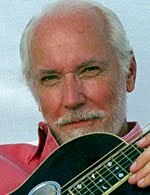 As the 'Learning' page of his website shows, he is an accomplished teacher - a point that is underlined by his article 'Fundamentally good playing' in the current issue of British Bluegrass News (no. 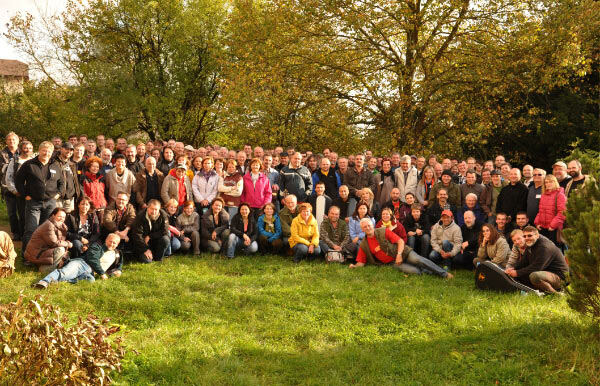 62, autumn 2012). He can be contacted by e-mail, and is also on Facebook. 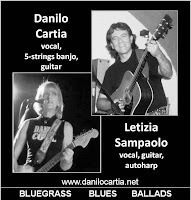 Danilo Cartia (banjo, guitar, vocals) and Letizia Sampaolo (guitar, autoharp, ukulele, vocals) will present bluegrass, blues, and ballads this week on Thursday 25 October, beginning at 21:30 in the Pirati Pub, Via Mario Menghini 97, Rome, Italy. Admission is free. 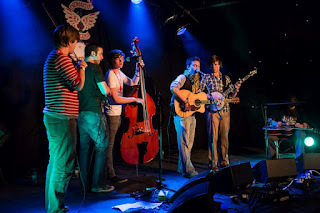 Lands End are a diverse group of young musicians who first came together at one of Europe's premier bluegrass workshops, the Sore Fingers Summer School, held annually in Oxfordshire, England. 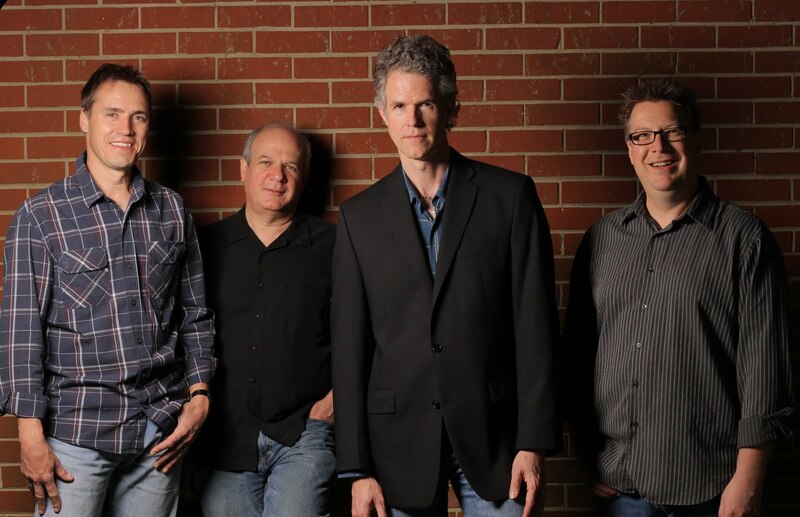 Originally formed for a one-off show, the band, who have been tutored by some of the most prolific names in bluegrass, made such an impact in their first performance they couldn’t possibly stop there! Their name, 'Lands End', pays tribute to the fact that each member comes from a different geographical location - Cork, Galway, Dublin, Munich, Liverpool, and Canada. 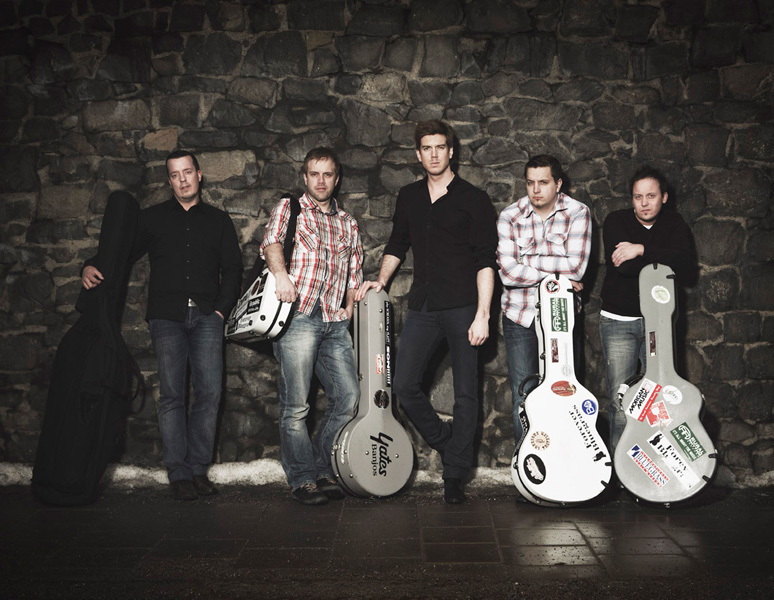 Lands End consists of Richie Foley (mandolin), Sam Rose (bass), Paddy Kiernan (banjo), Bruno Pichler (Dobro), Hubert Murray (guitar, vocals), and Sam Draper (fiddle). 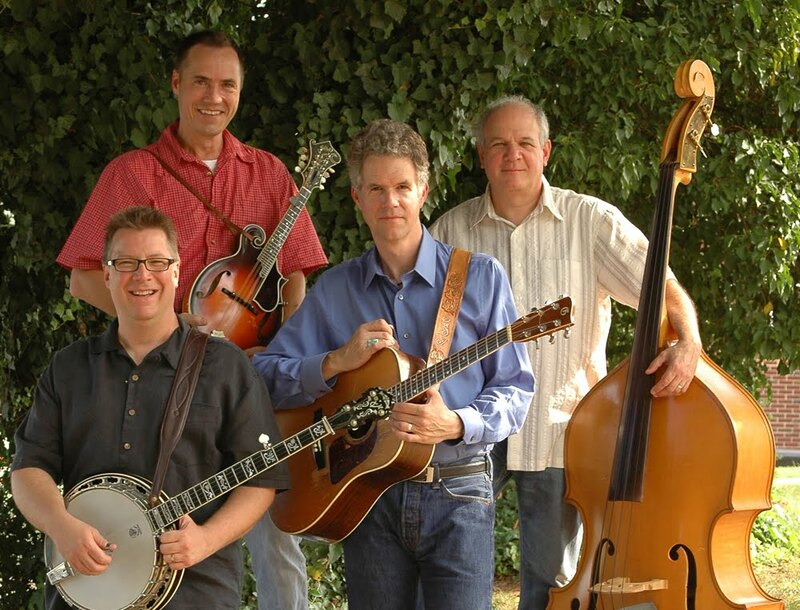 Although their music is strongly embedded in the bluegrass tradition, each member brings the distinctive sound of his own tradition to the musical arrangements of the band. Playing a mix of original material with bluegrass standards and the odd hint of Celtic and Baltic tastes, Lands End have been gathering huge momentum since they formed in April this year. 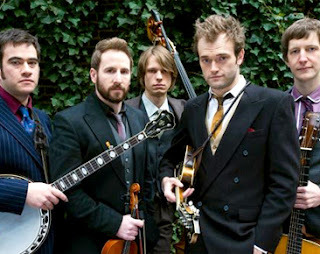 They played several dates in Ireland this summer before performing at Ireland's largest free bluegrass festival in Dunmore East, Co. Waterford (IRL), and at Didmarton Bluegrass Festival (GB). 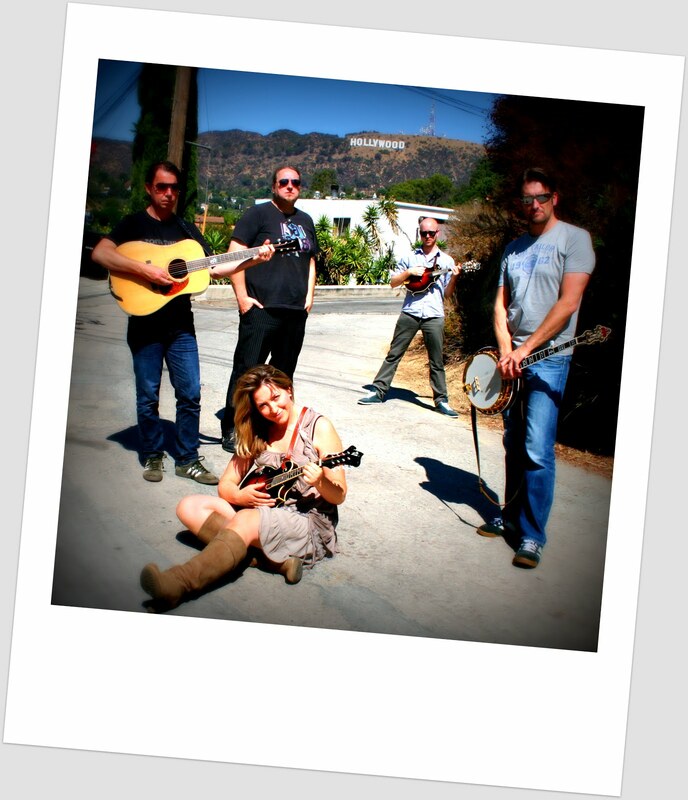 Lands End are starting work on their first studio album in December this year. 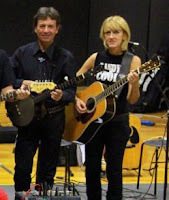 They can be seen on a twelve-and-a-half minute YouTube video, recorded in St Mary's Collegiate Church, Youghal, Co. Cork, Ireland, on 11 August 2012. Several more videos of Lands End, recorded during their set at Didmarton (where the photo above was taken), are also on YouTube. 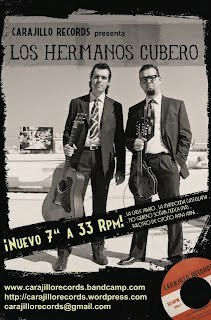 Thanks to Los Hermanos Cubero of Spain for the news that their second record, a 7" vinyl EP released by Carajillo Records, will be launched in Barcelona on 8 November 2012, beginning at 10.00 p.m. in the Club Heligàbal, Calle Ramón y Cajal 80. Admission is €6 (€10 with a copy of the record). The A side of the EP, 'La calle abajo', is featured in a videoclip produced for Primitive Films, which will be premiered at the launch. A video poster for the event can be seen on YouTube. Thanks to Philip Zanon, president of Double Time Music, for a complete schedule of the forthcoming European tour by the Kruger Brothers (CH/USA), mentioned on the EBB on 23 Sept. 2012. The tour begins on Sat. 3 Nov. with the Banjo Event 2012 at the Eagle Music Shop in Huddersfield, northern England. Eagle Music is the official worldwide #1 master dealer for Deering Banjos, and Greg and Janet Deering will be present at this one-day festival, which includes concerts, workshops, picking sessions, bar, food, raffle, and trade stand, together with performances by the Kruger Brothers and leading English bands - the Down County Boys, Chris Cooper, the Kentucky Cow Tippers, Joe Mac & the Old Grey Dogs, and more. Full details, with online booking facilities, are on the Banjo Event 2012 web page. For all Swiss dates, the Brothers are joined by special guest Josh Day (drums and percussion), who has performed with the Kruger Brothers many times and has been their #1 choice for their classical collaboration works. He has also recorded with them, most recently on 'People get ready', the bonus track of their latest release, Best of the Kruger Brothers. Links to all shows, and online booking facilities, can be found at the Kruger Brothers online tour schedule, which announces that the final concert, at Laufen on 11 Nov., is now sold out. Thurs. 25 Oct. Blue Maxx, CC De Garage, Sint-Antoniusstraat 27a, 2520 Ranst / Millegem (aan kerkje), 20:00; admission free. For further info, 'phone 0497/56.05.00. 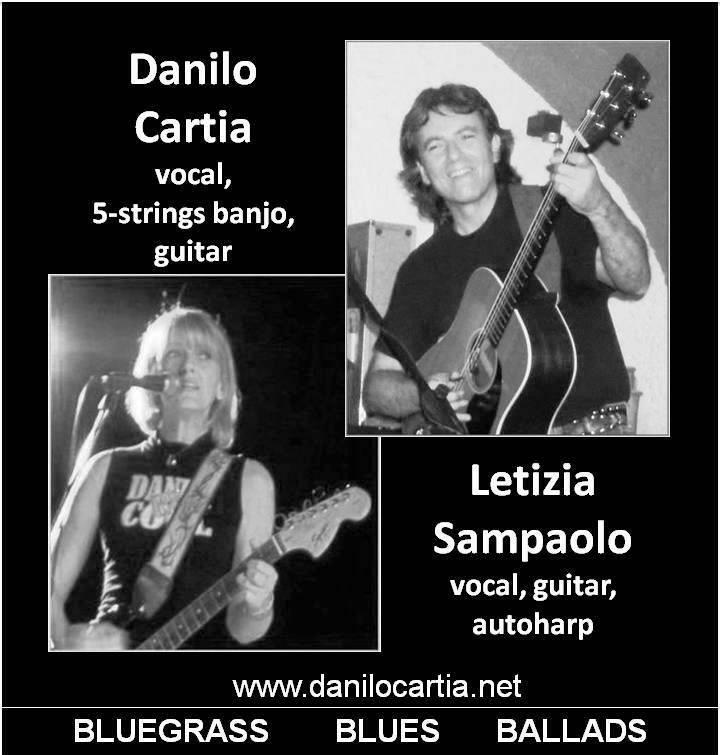 Danilo Cartia (banjo, guitar, vocals) will present bluegrass, blues, country, and ballads this weekend in two shows in towns on the coast west of Rome, Italy. The first, with Letizia Sampaolo (guitar, autoharp, ukulele, vocals) begins at 21:30 on Saturday 20 October at Fort Apache, Via Redipuglia 25 (Isola Sacra), Fiumicino, near Rome's international airport (info 06 65029150; 3312220329). Admission is free. 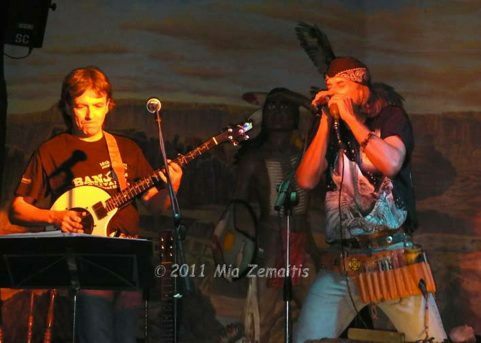 In the second, Danilo will be joined by Leno Landini (harmonica). The show starts at 18:00 on Sunday 21 October in the Sala Consiliare Comune, Tarquinia. 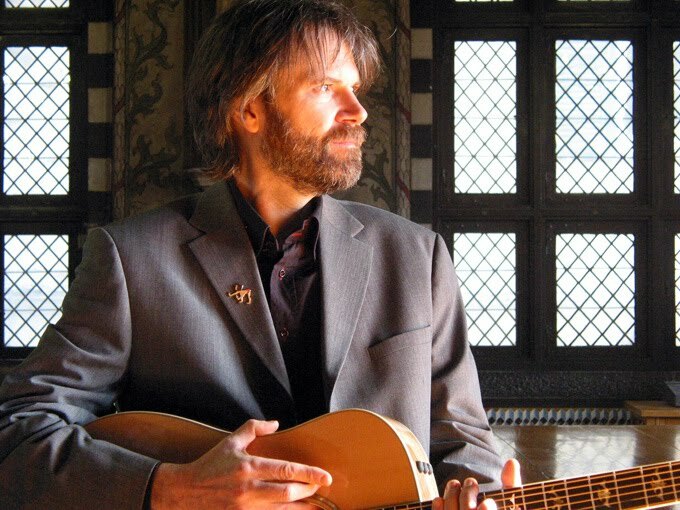 The latest e-mail newsletter from Italian guitar maestro Beppe Gambetta opens with a list of the dates in his coming tour of Germany and Switzerland, beginning on 21 Oct.. 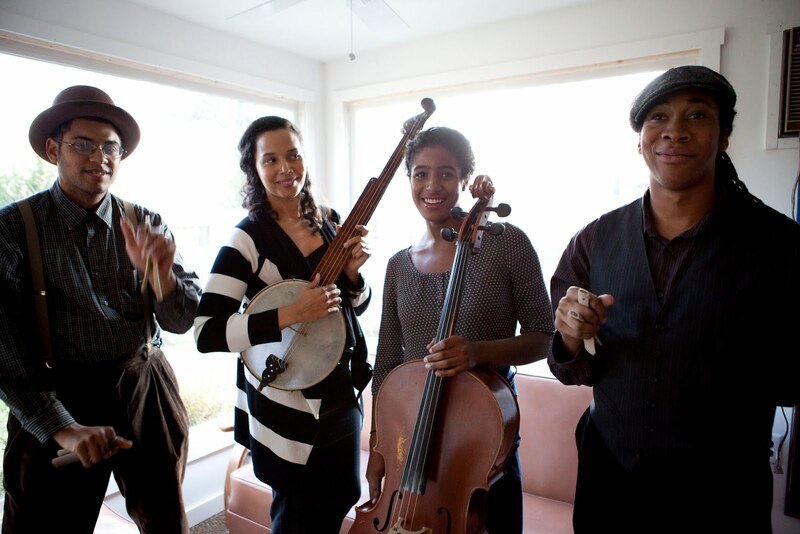 The tour includes concerts and workshops in Weingarten, Nuremberg (Nürnberg), and Berlin. Full details, including links to venue websites, are on Beppe's online calendar. 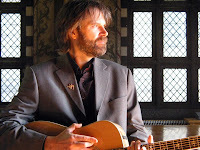 Next year the 21st Beppe Gambetta International Acoustic Guitar Workshop at Ambroz, Slovenia, will feature three teachers - as well as Beppe, Mike Dowling (USA) will teach flatpicking, blues slide guitar, and vintage jazz, and Chris Newman (UK) will teach flatpicking, Celtic, and improvisation. Beppe's German-language DVD The art of flatpicking guitar (trailer on YouTube), on Peter Finger's Acoustic Disc Company label, has been well received, together with his compilation CD Collection. 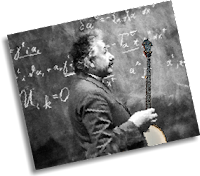 The newsletter also includes Beppe's recommendation of a documentary film on country music, his choice of ten YouTube videos of great guitarists, and his memories of Doc Watson - culminating at Doc's funeral. To receive full newsletters, contact Beppe Gambetta through his website. 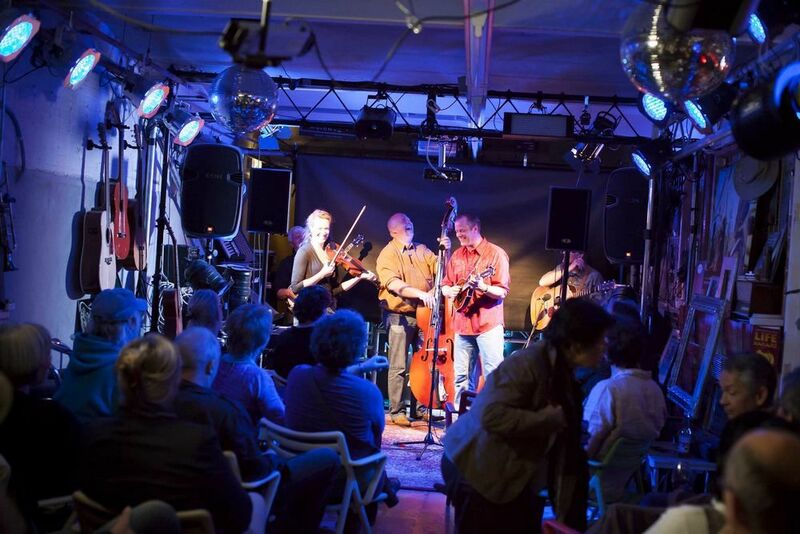 UKBluegrass.com - since 2006 the most valuable source of day-to-day information on what's happening on the British bluegrass scene - has been at a very low level of activity during this year's festival season. 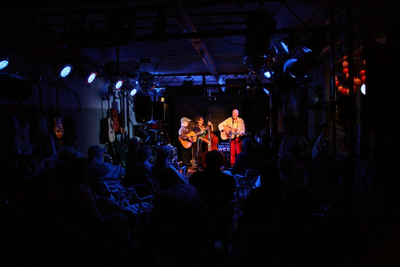 Its founders and operators, Katherine Selby and Jer Boon, have been moving house, and have accordingly taken a not-quite-complete sabbatical from bluegrass activity. It is good to be able to report that UKBluegrass.com is now resuming its position as a vital part of the bluegrass media in Europe. I hope you are all well and I apologise for the lack of newsletters. The last one was 5 August and I cannot quite believe where the time has gone. Up until last week your music was being played on my radio shows even though I didn't have time to send out newsletters and playlists. I just haven't had the time. I am writing this week to say that unfortunately I will not be running my regular radio shows for a while - at least until the new year, when I will then review what time I have to devote to the shows. Due to my increased workload and the projects that I want to work on over the winter, I initially thought I could manage these voluntary programmes on a fortnightly basis, but the hours that have to go into producing just four programmes a month is a lot more than I can give at the moment. I will have all the specials ready for Christmas at least. That includes the Hungarian, Swiss, and Orwell bluegrass festivals. Feel free in the meantime to send your music directly to the stations as they will still pop them in play. 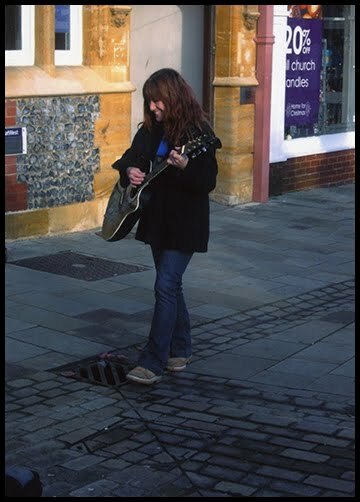 The stations are UK Country Radio and Bluegrass Planet Earth. I've done my very best over the last three years to promote you all as much as I can, and more importantly to promote European bluegrass music. I might well be back in the new year, so watch this space. All the specials will be repeated at Christmas too, including the older ones I've done, so that listeners are still aware of the festivals around Europe, when they take place, and of course the fabulous bands/music that is present at them. The Carolina Chocolate Drops (USA), spearhead of the revival of black string-band music, are now on tour in Europe. On 12 October they will complete a series of shows in Ireland and Britain, and will go on to play four shows in France, one in Belgium, two in the Netherlands, and three in Germany. More details, including venues and online booking facilities, are on the band's tour schedule. 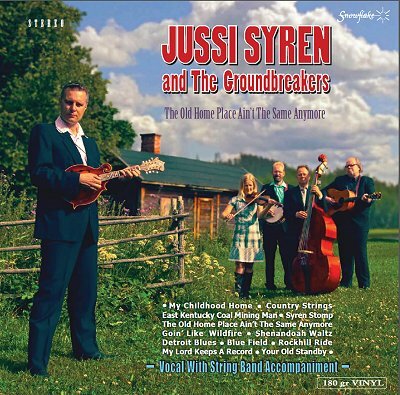 Bluegrass Today features The old home place ain't the same anymore, a new album by Finland's Jussi Syren & the Groundbreakers. 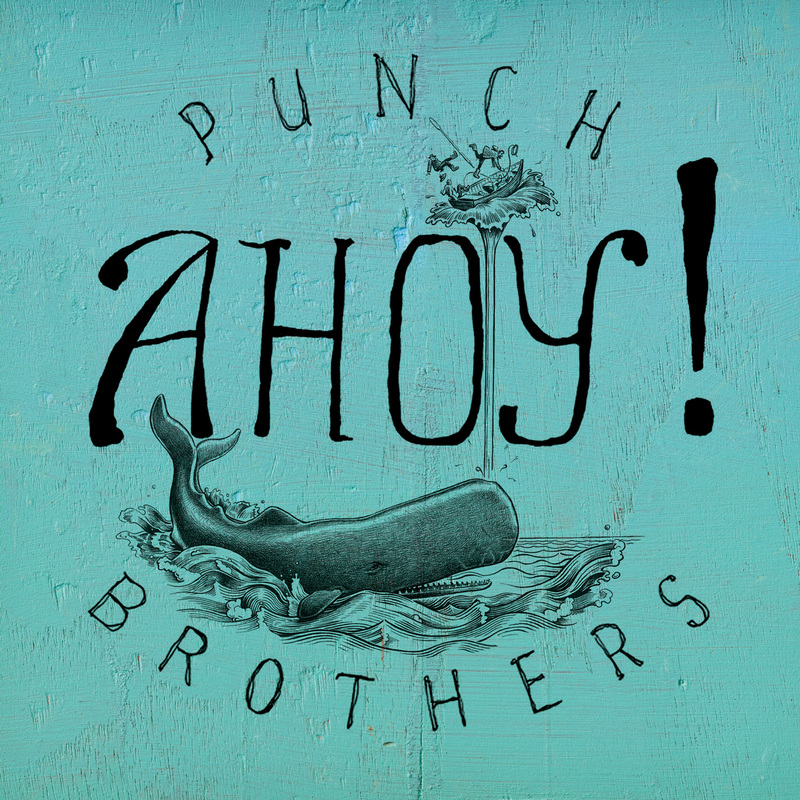 Scheduled for release on 15 October in both CD and LP format, this is the band's eighth album, and features Nelli Ikola on fiddle, who has been a regular member since their last record. A video made in the recording studio can be seen on Bluegrass Today, where you can also hear audio clips of three tracks from the album. All the material consists of original compositions by Jussi Syren, and the album can be ordered online. 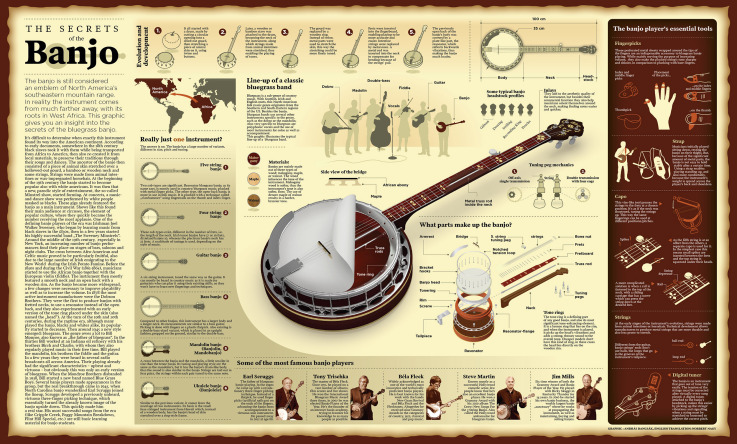 Bluegrass Daily - an online newspaper dedicated to everything bluegrass - is now being updated twice daily. Bluegrass Daily uses over twenty online sources to update its worldwide bluegrass contents. It also includes videos and topics such as education or stories. You can also subscribe to it and get the main headlines in your e-mail box as soon as the newspaper is updated and published. Feel free to e-mail additional online content not included to SwissGrass Productions.